Spotlight on My Father's Words by Patricia MacLachlan, Plus Excerpt & Giveaway! 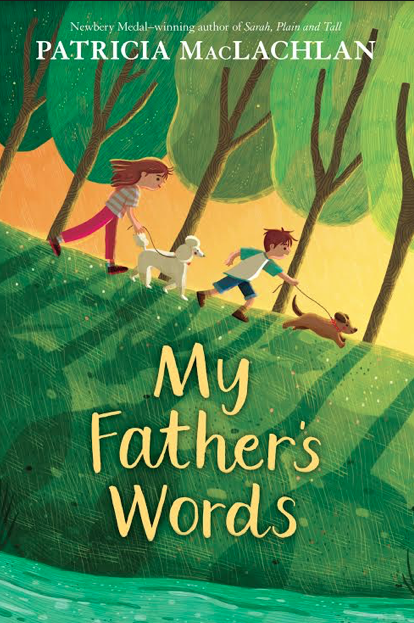 Today we're excited to spotlight My Father's Words by Patricia MacLachlan. Read on for more about Patricia and her book, plus an excerpt & giveaway! Patricia MacLachlan is the celebrated author of many timeless books for young readers, including Sarah, Plain and Tall, winner of the Newbery Medal. Her novels for young readers include Arthur, For the Very First Time; The Facts and Fictions of Minna Pratt; Skylark; Caleb’s Story; More Perfect than the Moon; Grandfather’s Dance; Word After Word After Word; Kindred Souls; and The Truth of Me; she is also the author of countless beloved picture books, a number of which she cowrote with her daughter, Emily. When I got up in the morning, my mother had already gone to class. Luke was sitting in the kitchen, eating cereal. Finn was next to him, eating toast and jam. I could tell he had a question to ask. “Will this be fun?” he asked Luke. Luke looked quickly at me. “I don’t know if it will be fun, Finn. But it will make some sad dog happier,” said Luke. Finn nodded. What Luke said could have been said by my father. Finn opened the book at the top of his pile. “Do you think one of the dogs will like The Year at Maple Hill Farm?” he asked. My father had given Finn that book for a long-ago birthday. It was Finn’s favorite. He loved the passing of seasons and how the animals lived. I couldn’t think of an answer. “Yes. But mostly the dogs will like you,” he said. “Get a bag for your books. We have to go soon.” Finn ran upstairs. “I haven’t had breakfast,” I said. Luke handed me a piece of Finn’s toast and jam. I looked sideways at him, about to say something about his notes to Finn. But I didn’t. Those words belonged to them. When we opened the door to the dog shelter we were surrounded by happy dogs. Little dogs ran out to be petted. A refined poodle looked over the counter. The poodle came out from behind the counter and walked up to Finn. He grinned. She opened the door and we went into a room that was quiet. When Marco heard his name, he looked up and wagged his tail. We heard Penny’s soft voice. Several dogs came up to look at us. There were soft beds in their pens, and water bowls and food dishes, stuffed toys, and chew bones. “Are they all friendly?” asked Luke. Finn sat down on a pillow in front of a pen. Inside was a medium-sized, smooth-coated brown dog, facing away from us, staring at the back wall. Martha looked at us and shrugged. “I choose Emma,” said Finn. I touched Martha’s arm and whispered. Finn nodded and began reading in a soft voice. Two winners will receive a copy of My Father's Words (US only). This book hits home for me. Just the title alone brings tears to my eyes! This is a must read! I think the book sounds lovely and kind which is what kids need today. I love the idea of working with rescue animals. My son loved to visit the rescue center when he was in college to interact with the animals; it made him happy and peaceful inside. He has two rescue cats of his own now. Such a cute book. I love the illustrations and story line. Sounds like a perfect book to add to our collection! The cover is bright and fun. The synopsis sounds emotional and also fun as I adore dogs as characters in books. Love the dogs on the cover! The synopsis sounds amazing! This cover is very pretty. I think my niece will enjoy this story, too. I love the bright inspiring cover. This story sounds emotional and uplifting. I like the cute and colorful book cover. This story sounds full of hope and healing.